How does Apple charge premium prices for iPhones that have technical specs inferior to many Android phones out there? How does Starbucks get you to pay RM11 and above for a cup of coffee that you can get for RM2 at the nearest mamak store? How does our very own local retailer, Giant, makes you feel that you are always getting a bargain while shopping there? A strong brand translates into a significantly higher corporate valuation of your company. For example, Apple’s strong brand and phenomenal brand loyalty add a whopping $182.8 Billion to its company’s value. Consumers and corporate buyers are human. Humans are creatures of habit, and we prefer to make our decisions based on cues. The stronger these cues, the more automatic the decision to buy from your brand versus your competitors. Customers who have deep brand loyalty to your brand often act as evangelists for your brand. In this case, if a product is defective/not satisfactory in any way, consumers often forgive the brands they are loyal to. Consumers have an inclination to highly value the consistency in the experience that they have with the companies that they interact with. This is important as it provides strong brands with a strong defence against competitor cutting prices or “price wars”, and also creating strong barriers to entry for firms looking to enter the market. A strong brand also turns employees into Brand Advocates. Thus, creating a strong latent “always on” sales force of people promoting your brand, and it also makes it significantly easier for you to attract the best talent to work for your company. 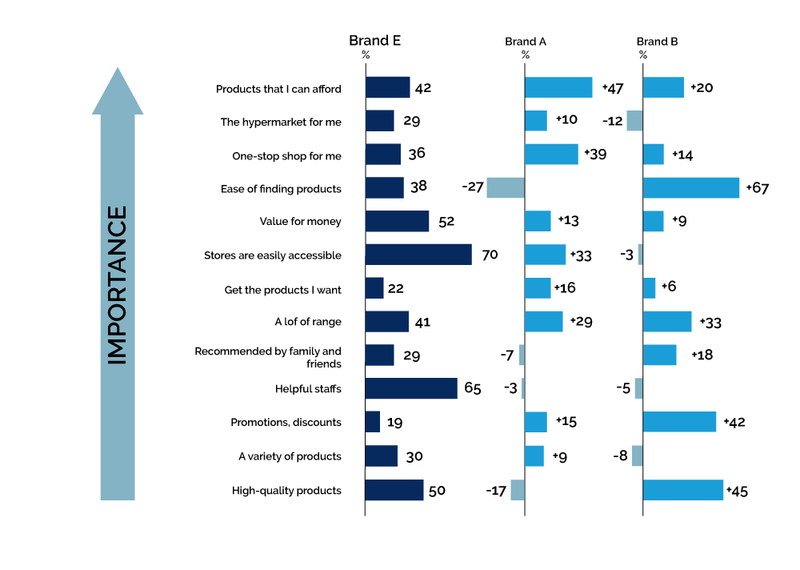 How Do We Measure Brand Strength and Brand Loyalty? The strength of a brand and a measure of the degree of loyalty customers have for a brand is done via scrutinising each part of the marketing funnel. Beyond that, the strength of a brand and the loyalty towards it highly correlates with the number of emotional connections or impressions that it leaves on its customers and prospective customers. This is measured by calculating the share of emotions that a brand manages to garner and comparing it against a brand’s main competitors to provide a holistic view of the share of emotions that a brand manages to achieve in the marketplace, thus being a good indicator of the brand’s strength. There is an old marketing adage called a Rule of Seven, which states that a prospect needs to hear or see your brand 7 times before they buy from you. Therefore, having good brand awareness is the big first step towards building a strong brand. When a consumer or respondent thinks of your industry, they think of your brand first. This stage of awareness is possible when your brand has carved a unique space that fills a void in the mind of consumers. The holy-grail, mother-of-all awarenesses. When a consumer or respondent can quote your brand name without the need for any assistance or prompts. This means that your brand has carved a space within the mind of consumers, thus, giving your brand a certain amount of consideration. When a consumer is aware of your brand, after prompts. At Oppotus, we take our awareness study a step further. Besides comparing the 3 stages of awareness against your closest competitors, our brand health studies also (a) break the levels of awareness down further by state/location and (b) help our clients identify the most effective information sources that will help our clients effectively allocate their marketing spend. Brand E has managed to gain significant brand awareness in 1 year. In this case study, we will be using Brand E. We can see that overall, being a relatively new brand being in the country just 1 year, they have managed to gain significant awareness in the market. We also found that for this brand, the awareness is largely driven by Brand E being found in malls and the visibility of outdoor store signage. Brand awareness according to 5 different locations in Malaysia. When we broke the data down further by location, we found that Brand E’s awareness is disproportionately strong in Penang and Klang Valley. From this data, based on their internal budgeting, the client will be able to evaluate the performances of the teams for the different outlets based on many other internal considerations such as budget allocations, previous marketing strategies and considering the maximum upside in those particular markets to determine an effective allocation of resources. A further breakdown of the sources of brand awareness below can help Brand E pinpoint the main channels where customers are finding them, as well as identify new potential channels based on what is working, and not working for their competition. Sources of brand awareness for Brand E and their competitors. Before planning a marketing campaign, we believe it is extremely important to identify which channels are the key information sources for your customer base to maximise the effectiveness of your marketing spend. Key information sources for your brand. 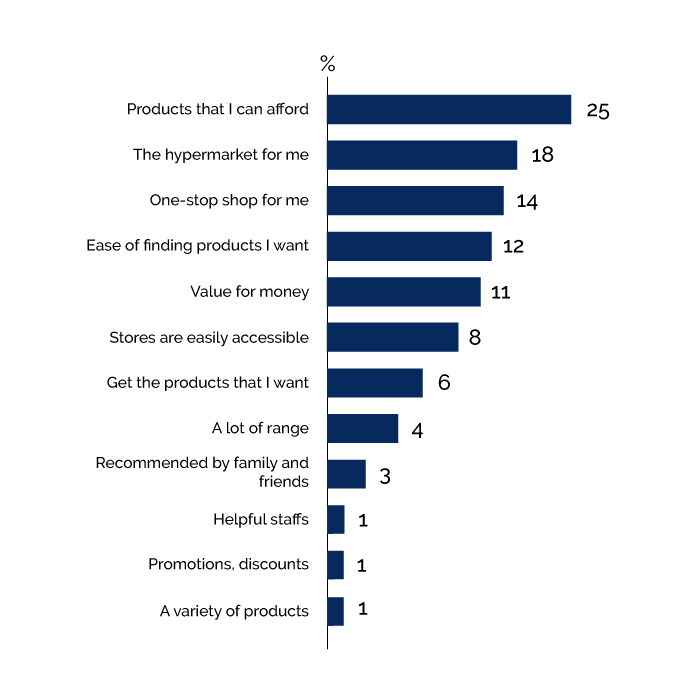 In this study, would be able to ascertain that for hypermarket products, the top 5 channels that need to be invested in are friends and family word of mouth, in-mall personnel word of mouth, television, social media websites and roadshows, fair and expos. The data gets pretty interesting once you break it down by states as well, where u see a different picture. For example, people in Pahang respond extremely poorly on social media. Therefore, the client should refrain from targeting so much in Pahang to gain exposure for the products they offer. The marketing funnel is a way of looking at data to understand how to move people who are aware of your brand, all the way to convert them into loyal customers or evangelists. It is done by measuring conversion rates at different levels of the customer lifecycle. Top management of a company should definitely use it to identify bottlenecks and attrition points in the company’s value delivery structure to create visibility to be able to make plans on improving the customer lifecycle and value delivery processes within the company. The next step beyond measuring awareness and information resources would be to measure the conversion rates of your marketing funnel compared to competitors. The information garnered from this has significant strategic value, to inform operational improvements, strategic allocation of resources and even manpower requirements. 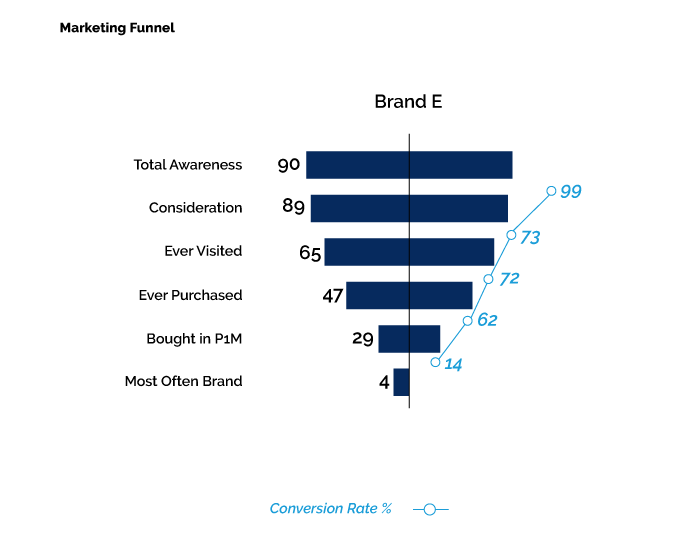 Marketing funnel of Brand E.
This case study, for example, illustrates the client’s brand having an extremely strong conversion at the top of the funnel, however, has an under average conversion of customers purchasing in the past 6 months to “most often” customers. This could be because of a plethora of reasons. Perhaps the in-store experience is not up to expectations, or the product selection is not sufficient, or customer service is bad. This could be surfaced in a further study called CSAT, which you could read more about here. In today’s world of ever-shortening attention spans, how does your brand cut through the clutter and reach customers above and beyond your competitors? Multiple studies have proven that emotions are a primary driver of purchase decisions. Understanding brand discernment from the points of view of consumer perceptions has always been at the heart of pursuits of advertisers and marketers alike. Going after ‘share of mind’ or ‘power in the mind’ — getting consumers to associate a brand with an idea — feels somewhat dated. Through studies, popular brands have created multifaceted personas. They could make you feel many different ways about them at different times — laugh, cheer, touched, lean forward and take notes. They no longer focus on share of mind, but more so chasing the share of emotion. Therefore, we at Oppotus strongly believe that only by creating strong, emotional connections with your customers and potential customers (regardless of positive or negative), your brand stands a chance of shining above the competition. For your brand to really shine, it needs to create multiple, strong emotional connections with your customers. Thus, by not tracking emotions in your brand health tracking study, the results will never be complete. Both these metrics represent the emotional sway and the impact of your brand in the marketplace. For example, a brand could obtain industry leading Brand Impulse scores, but negative or extremely low Market Impact scores. For example when a viral PR disaster hits a brand, their Brand Impulse index would be high, however, the brand would suffer from negative Market Impact Scores, forecasting plummeting sales. This candlestick chart within the Perceptor report quantifies for the client the percentage of positive vs negative emotions that are associated with a client’s brand. The first candlestick on the left represents the positive emotions vs negative emotions ratio of the market as a whole, while the first candlestick represents the client’s customer sentiment. The inference that the client could draw from this data would be that he/she should invest more in increasing the intensity of its current marketing initiatives to increase the exposure of people to the client’s brand message. Conversely, for competitor D, its Brand Impulse has a score of 36, while its Positive vs Negative Emotions ratio is significantly lower than the market. This informs competitor D that they should make a switch in strategy to consider a rebranding exercise to switch the market perception towards their brand if they aspire to build a brand that can be leveraged to generate supernormal returns. Besides that, our proprietary surveys also reveal the exact levers that affect the Perceptor scores. 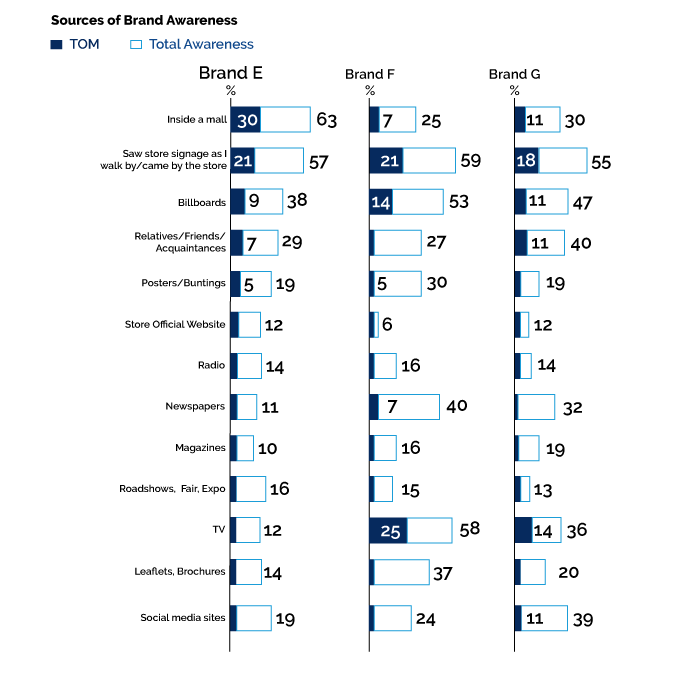 As you can see in the disposition chart, there are 53% of the market although having awareness of the brand, doesn’t find it compelling enough to start considering it yet. Winning the market involves understanding what drives the market and positioning your product accordingly. Therefore, knowing exactly what customers in your market responds to is of utmost importance to making our clients’ marketing campaigns razor sharp. 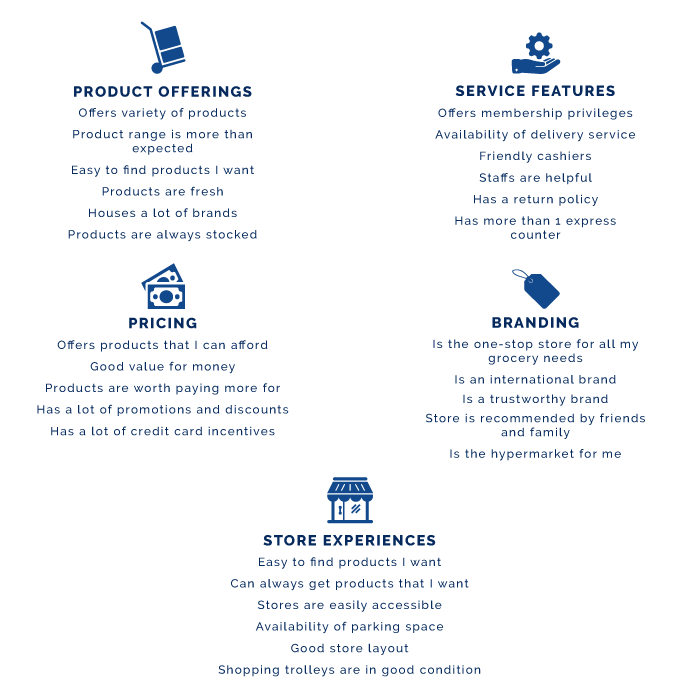 Below is an example of the features that drives brand perception for the hypermarket industry. 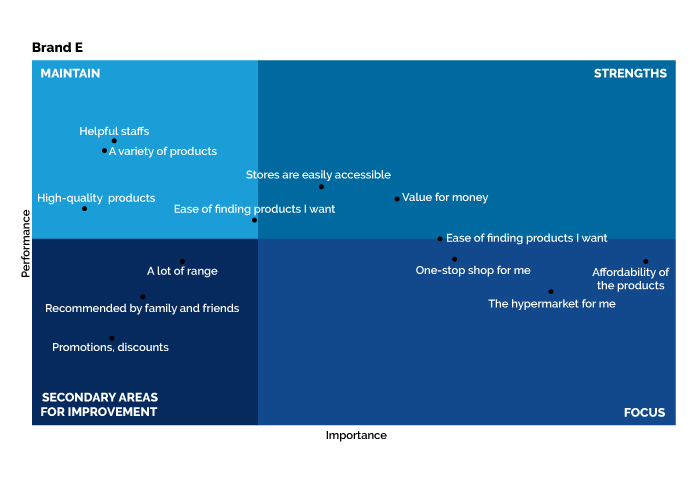 Drivers of brand perception for the hypermarket industry. After identifying all the drivers of brand perception, our study further prioritises them based on our carefully crafted survey questions to surface what are the key drivers of brand strength in a brand’s industry. Key drivers of brand strength in a brand’s industry. From that, a comparison against other major players in the industry is done which will enable top management to make major brand decisions like brand positioning and also whether to invest more resources to bolster certain aspects or perceptions towards their brand. A comparison of other major players in the industry. 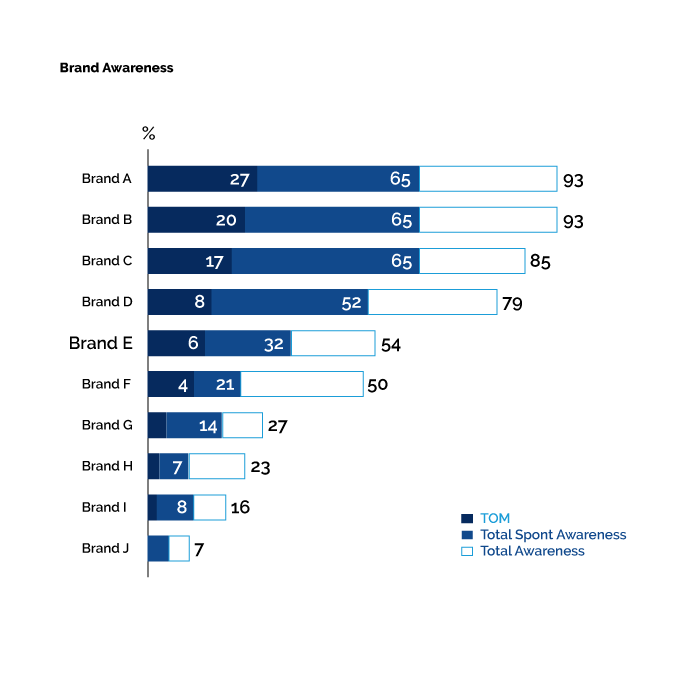 And finally, we would derive an actionable scoreboard that highlights the Areas of Focus where a brand is relatively weak at, while has been identified as a key brand strength driver in its industry. An example of an actionable scoreboard that highlights the areas a brand can focus on. Measuring your brand is an intricate process that requires carefully crafted questions to unearth hidden sentimental and emotional perceptions of your target customers’ minds. 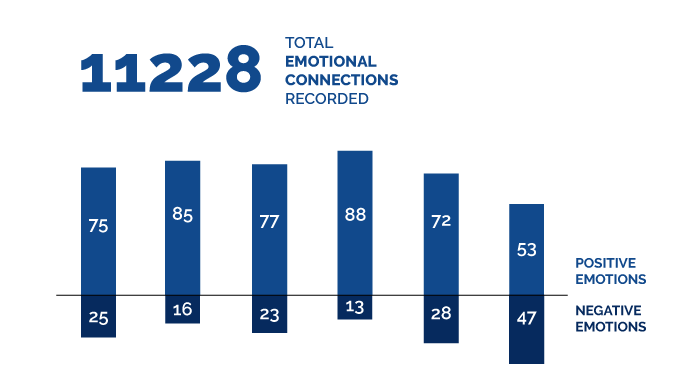 At Oppotus, we believe that emotional connections for the basis of a strong brand, and thus, needs to be measured. Tell me more about Perceptor to track and study my brand’s health.